Too late, Mitch Daniels has learned one of the unfair rules of politics: Few people care about a politician’s book unless he might run for president. Daniels to give closely watched DC speech. Daniels to talk education in Washington, D.C. 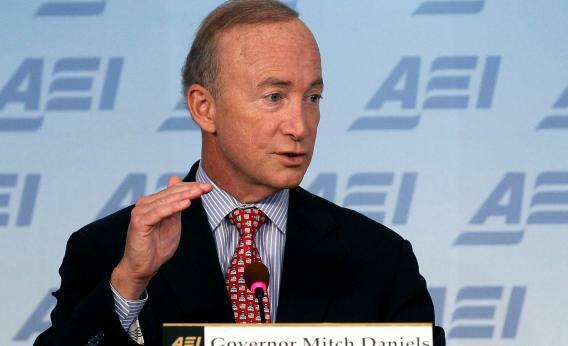 Yesterday, Daniels stopped at AEI again to talk about his new book and take questions. The media impact: One friendly story from AEI’s magazine, The American. Too bad, because Daniels, a former director of OMB, tried to make some news. Asked about the tax goals of the supercommittee, he said that “you’re gonna need more revenue,” defying the Republican line that “we have a spending problem, not a revenue problem,” and looking to a future wherein Americans paid reasonable taxes to fund a partially-privatized welfare state. He tried to make more news with my colleague John Dickerson. In the Republican debate held in Ames, Iowa, in August, candidates were asked to raise their hands if they would oppose a long-term budget deal that included a 10-to-1 ratio of spending cuts to tax increases. They all did (and Rick Perry, who wasn’t yet in the race, later affirmed that he would have joined them). In an interview for CBS, I asked Daniels what he would have done. “I would not have raised my hand,” he said. But who’s noticing? I am, but being pedantic about wonky Republicans is part of my job. The rest of the political-media complex has moved on, ready to read new runes from Chris Christie.